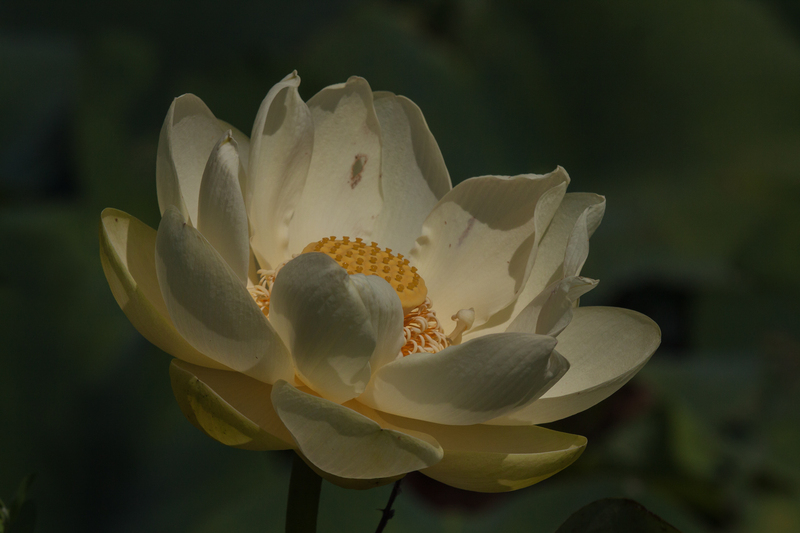 The lotuses were a bit faded and past their prime last weekend at Lilypons Water Gardens, but the beauty and elegance of the lotus flowers was undiminished in my eyes. 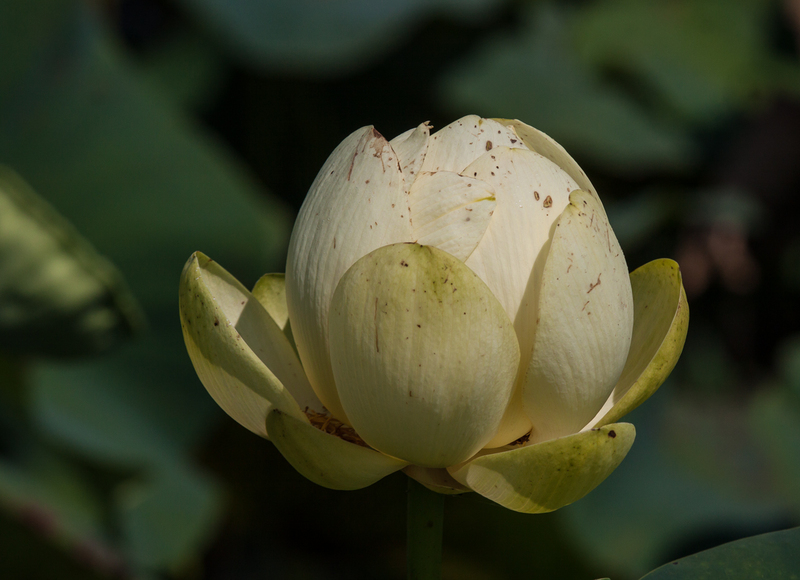 I love the look of the lotus throughout its life cycle—from the elegant simplicity of the bud to the showy outburst of petals to the alien-looking seedpods. The beauty of the lotus never fades, though it is transformed and changes as the flower grows and matures. 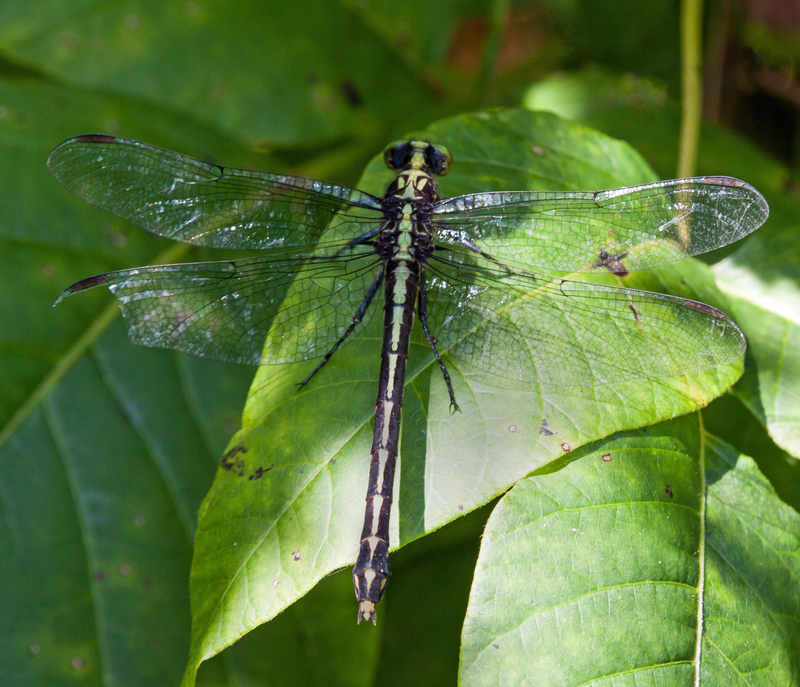 Last Saturday at Lilypons Water Gardens in Adamstown, Maryland I spotted a large dragonfly that I had never seen before, a Black-shouldered Spinyleg (Dromogomphus spinosus). That’s definitely a cool (and descriptive) name for a spectacular-looking dragonfly. The dragonfly remained perched in the vegetation surrounding a small pond long enough for me to get shots from a few different angles and distances with my macro lens. I was particularly struck by the length of the long black legs, which somehow reminded me of those of a spider. 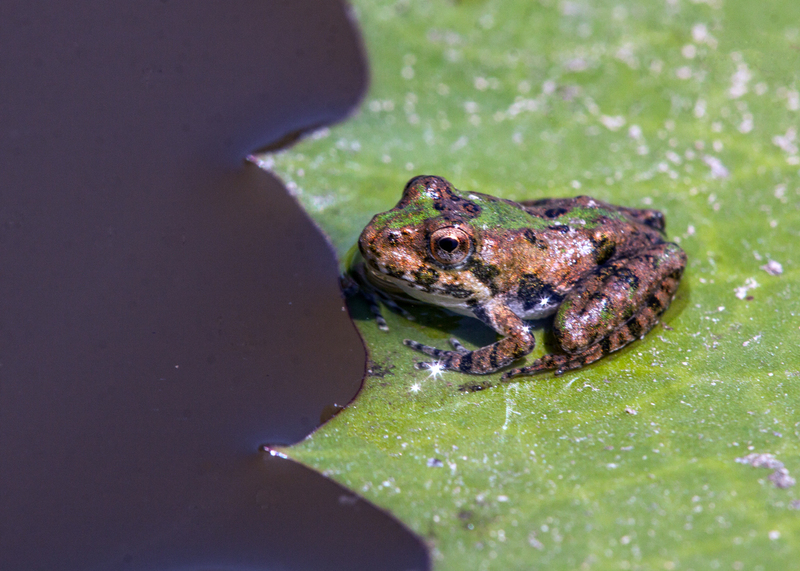 Perched at the edge of a lily pad, this frog at Lilypons Water Gardens was so small that I doubt I would have seen it by myself. However, one of my sharp-eyed fellow photographers spotted it and served as the hand model for the shot with the penny. A helpful Facebook reader suggested that this is probably a Northern Cricket frog (Acris crepitans) and it certainly does look like the photos that I can find on the internet. 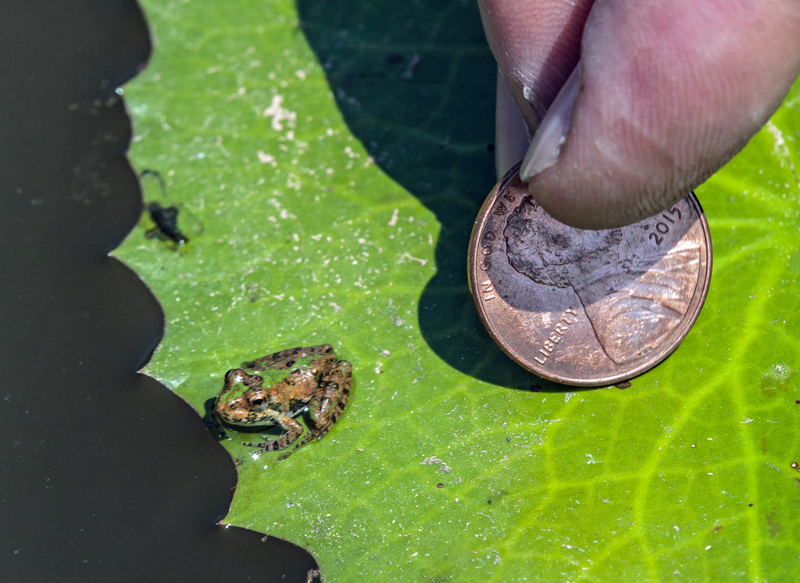 Judging from the size of the penny, which is 3/4 of an inch in diameter (19 mm), I’d guess that the frog was less than 3/8 of an inch (9.5 mm) in size. My fellow photographer tried to move the penny slowly into position, but, as I suspected would happen, the frog jumped away shortly after the second shot below. I would have liked to capture the frog in motion, but ended up instead with a shot of the vacant lily pad—the frog had jumped right out of the frame. When shot from a relatively low angle, this Six-spotted Fishing spider (Dolomedes triton) looks especially fearsome, although it was actually pretty small, only about an inch (25 mm) or so in length. 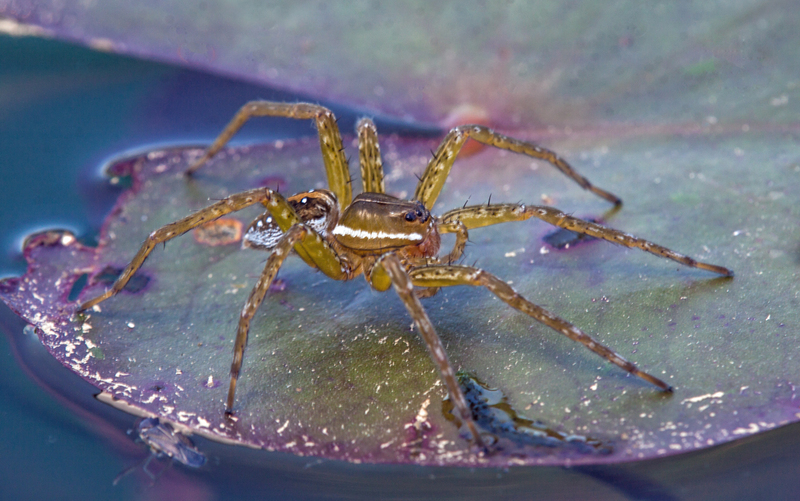 The spider was perched on a lily pad at Lilypons Water Gardens in Adamstown, Maryland. I haven’t taken very many damselfly photos this summer, in part because often I have been attempting to shoot dragonflies with my long telephoto lens. That lens has a minimum focusing distance of almost nine feet (2.7 meters) and it’s hard to see and focus on a tiny damselfly at that distance. This past weekend, however, I was using my 180mm macro lens and was happy to be able to capture some images of this beautiful female Fragile Forktail damselfly (Ischnura posita) during a trip to Lilypons Water Gardens in Adamstown, Maryland. 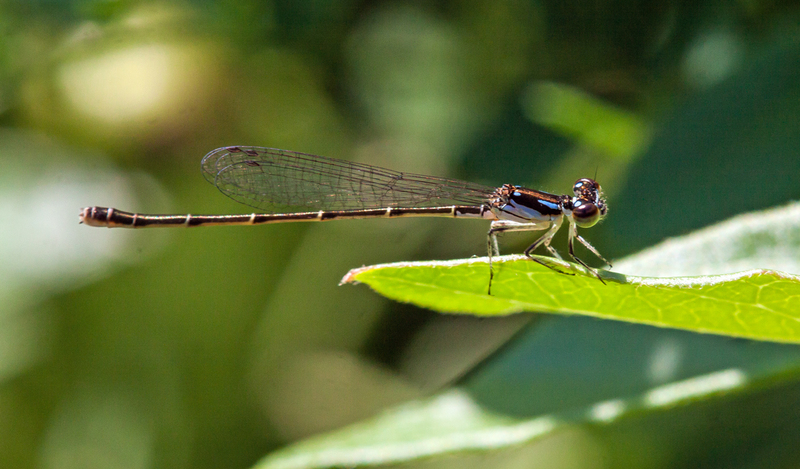 Damselflies are really small, but they pack a lot of beautiful details and colors into that tiny package. This particular species is special to me this year, because way back in April a female Fragile Forktail was the first damselfly that I spotted this season and presented in this posting. 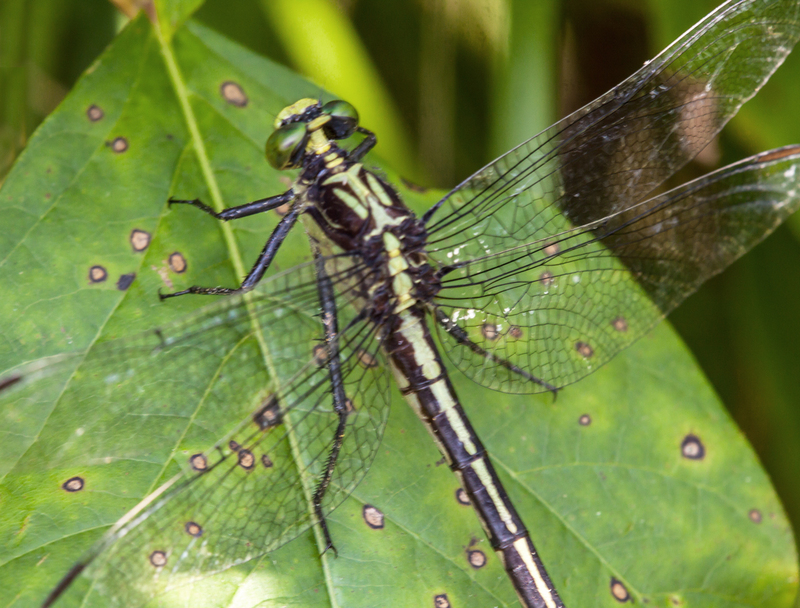 I really enjoy photographing familiar subjects, but there is still something really special about finding new ones, like this female Eastern Ringtail dragonfly (Erpetogomphus designatus) that I stumbled upon yesterday during a photo excursion with some friends to Adamstown, Maryland. 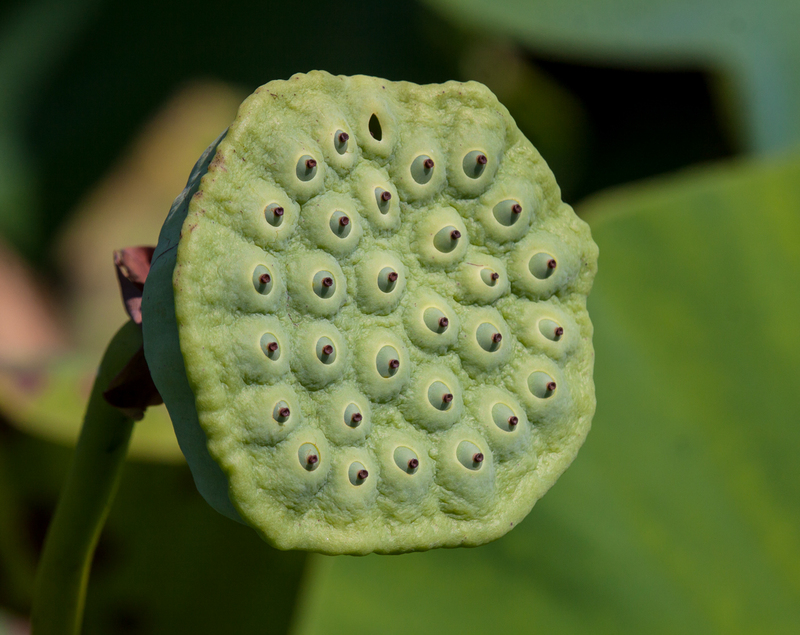 The goal of our visit was to explore Lilypons Water Gardens, a large facility that specializes in all kinds of aquatic plants and includes a series of interlocking ponds with waterlilies and lotuses. I suspected that there would be lots of dragonflies and I was not disappointed. While my friends were photographing the flowers, I started walking along the barely trampled paths that had knee-high grass and other vegetation. 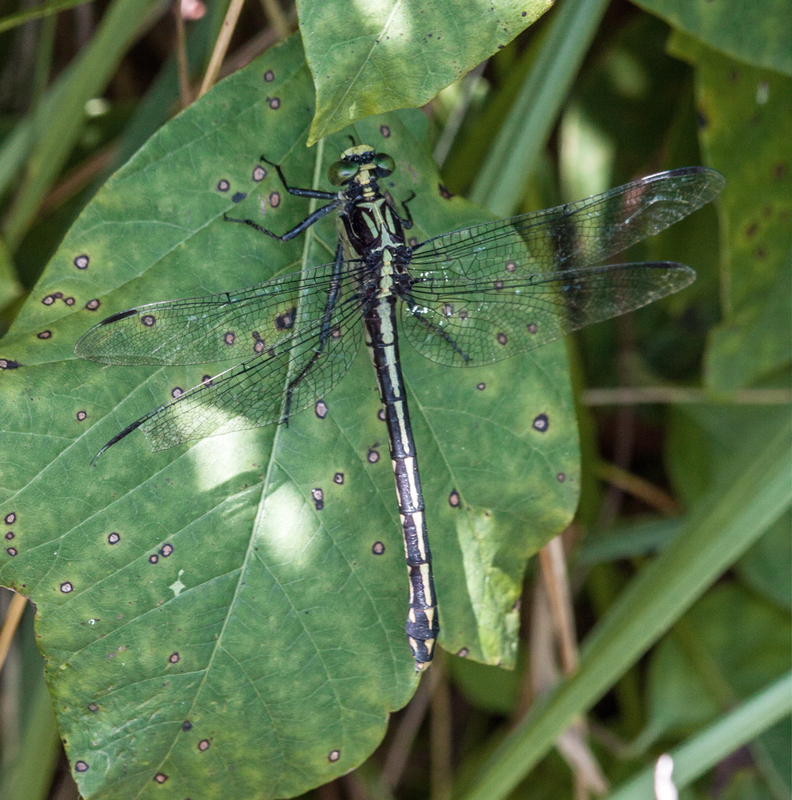 Most of the dragonflies that I spotted were familiar friends: Widow Skimmers, Eastern Pondhawks, Slaty Skimmers, Common Whitetails, and Blue Dashers, but a couple that I saw immediately struck me as being new and different. The very colorful and distinctive rings on the abdomen of today’s featured dragonfly, the Eastern Ringtail, really attracted my attention and somehow reminded me of the photos I had seen of a coral snake. Fortunately the dragonfly, unlike the snake, is not poisonous. 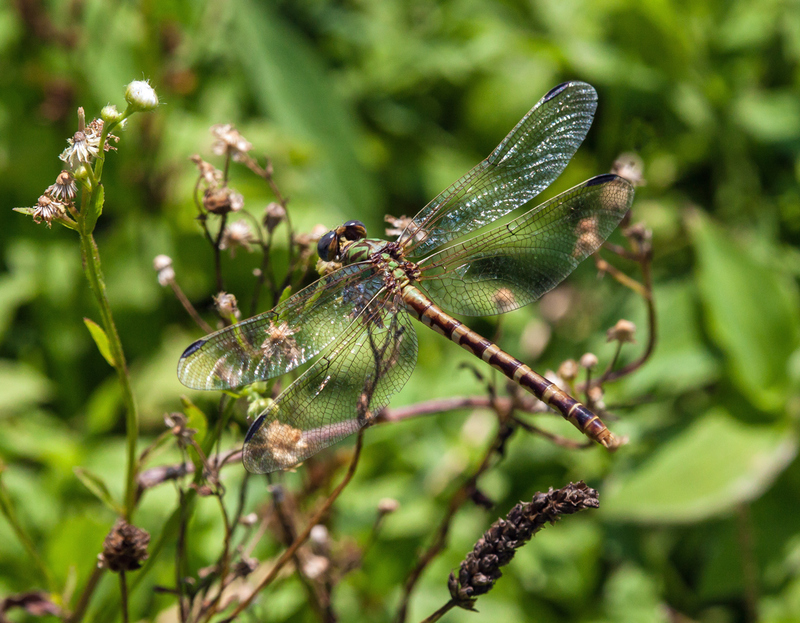 I chased the dragonfly for quite a while but never managed to get a shot of it with an uncluttered background—it kept perching on vegetation low to the ground. 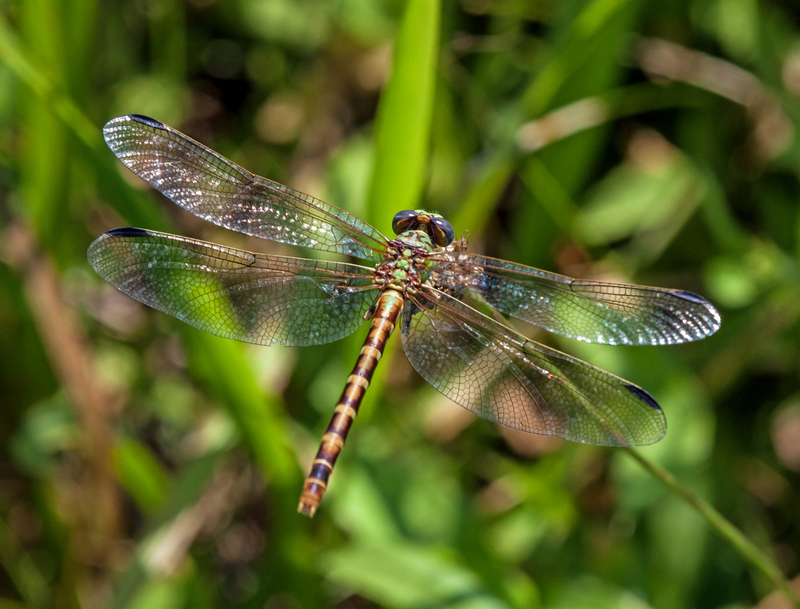 When I returned home, I didn’t have a clue where to start with identification, because I hadn’t gotten some of the kind of diagnostic shots that I need, as relative neophyte, to identify a dragonfly. So I did what I usually do in cases like this—I contacted Walter Sanford, my local dragonfly expert. He tentatively identified it as a female Eastern Ringtail and another expert in the Northeast Odonata Facebook group agreed with Walter. I’m pretty happy with my newest dragonfly find, a species I might have trouble finding again. According to the Maryland Biodiversity Project, the Eastern Ringtail is designated S2, which means that it is rare in the state of Maryland. 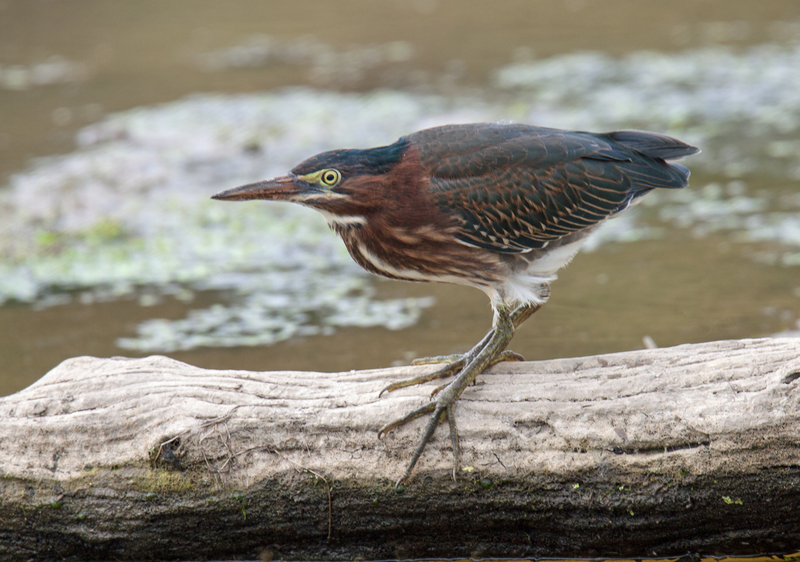 Recently Green Herons (Butorides virescens) have been more numerous than in the past at my local marshland park. Most of the time these little herons are obscured by the vegetation at the water’s edge or by the branches of the trees in which they like to roost. Early one morning last week, however, I watched one of them stalking potential prey from a log in an open area. 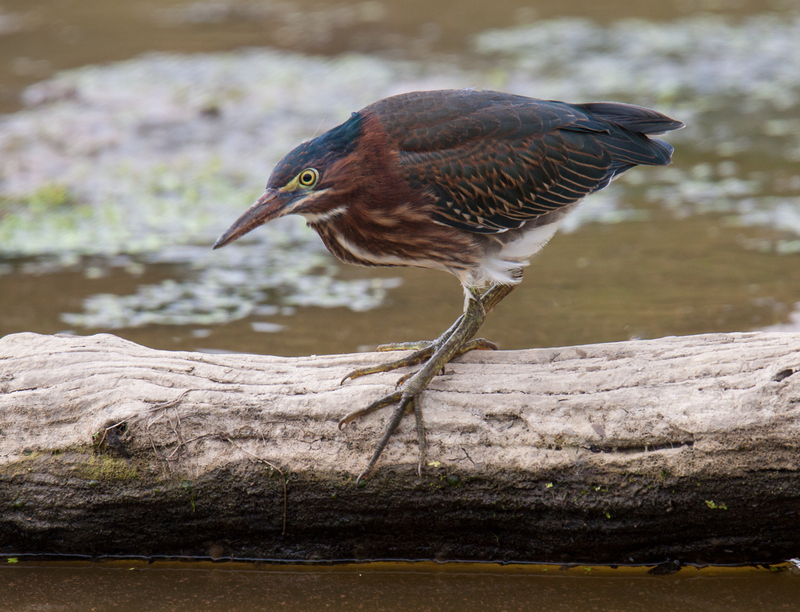 The little heron seemed focused, but relaxed. 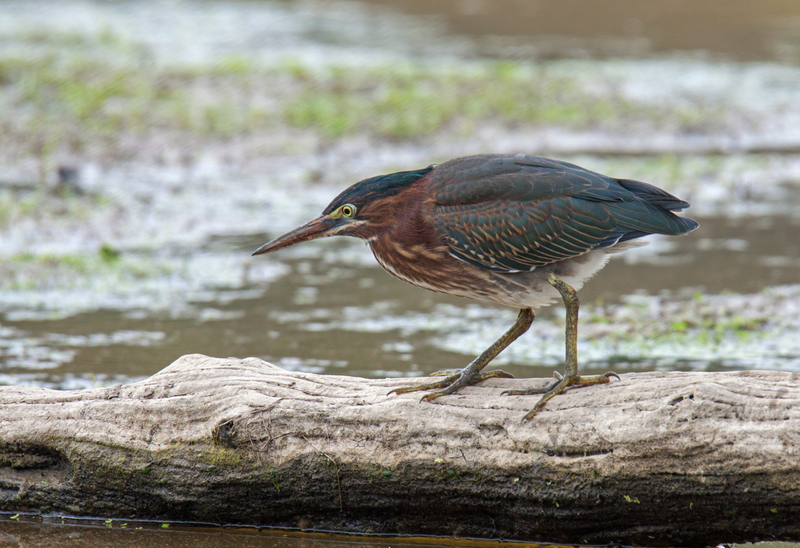 From time to time the Green Heron would become more alert and rigid and he would stare more intently at the water. On this occasion, they were all false alarms and I didn’t see him catch anything for breakfast. Eventually he seemed to give up and flew off, presumably to a better location for catching something to eat.